The Washington Post fact checker gave House Minority Leader Nancy Pelosi (D., Calif.) "Four Pinocchios" on Monday after she claimed an old 2010 quote from Senate Majority Leader Mitch McConnell (R., Ky.) about then-President Barack Obama was a "racist statement"
The Post, which rates factually inaccurate statements on a scale of one to four Pinocchios, defines four-Pinocchio claims as "whoppers." Pelosi appeared on NBC's "Meet the Press" on Sunday where she brought up McConnell's old quote from an inter­view that appeared in the National Journal on Oct. 23, 2010. "Let me re­mind you that when the Re­pub­lic­ans took pow­er when President Obama was president of the United States, what Mitch McConnell said is, ‘The most im­port­ant thing we can do is to make sure he does not suc­ceed.’ If that wasn’t a rac­ist state­ment. That is un­think­a­ble," Pelosi said. Fact checker Glenn Kessler pointed out Pelosi got the timing of Pelosi's statement mostly right, but notes she twisted McConnell's words out of context when suggesting it was a "racist statement." He then included a transcript of McConnell's interview where the then-Senate minority leader discussed the Republican strategy going into the 2010 midterms. "We need to be honest with the public. This election is about them, not us. And we need to treat this election as the first step in retaking the government. We need to say to everyone on Election Day, "Those of you who helped make this a good day, you need to go out and help us finish the job," McConnell said. "The single most important thing we want to achieve is for President Obama to be a one-term president." Kessler explained McConnell was saying that if Republicans wanted to achieve their goals, like repealing Obamacare, they couldn't just win the midterms, but they had to make sure Obama was a one-term president. He then included an excerpt of McConnell's speech at the Her­it­age Foundation af­ter the 2010 e­lec­tion. "Let’s start with the big picture. Over the past week, some have said it was indelicate of me to suggest that our top political priority over the next two years should be to deny President Obama a second term in office," he said. "But the fact is, if our primary legislative goals are to repeal and replace the health spending bill; to end the bailouts; cut spending; and shrink the size and scope of government, the only way to do all these things it is to put someone in the White House who won’t veto any of these things." Pelosi's comments during Sunday's interview were in response to to the ques­tion: "You’ve worked with Speaker Ryan, you know Senate Majority Leader Mitch McConnell, why do you think they ha­ven’t spok­en up as lead­ers in the United States against some­thing as per­ni­cious as white su­prem­a­cy and rac­ism?" Pelosi did not directly respond to the question, instead suggesting a history of racist behavior on the part of McConnell by resorting back to the 2010 interview in her response. The Post reached out to Pelosi's spokesman, Drew Hammill, to request comment about her statement on Sunday. "The leader’s lar­ger point is that President Obama was treat­ed dif­fer­ent­ly than oth­er pres­i­dents by Republican lead­ers like McConnell," Hammill said. "They under­mined him at every turn, ob­struct­ed his a­gen­da at lev­els not seen in the history of our coun­try and turned nor­mal­ly bi­par­ti­san mat­ters like gov­ern­ment fund­ing, in­fra­struc­ture, etc., into cri­ses over and over a­gain." Kessler said he found "numerous examples" of Obama thanking McConnell for helping him pass legislation, including making the George W. Bush tax cuts per­ma­nent and his work on free trade. Hammill said Pelosi's experience was different. "This is the leader’s o­pin­ion based on her firsthand experience," Hammill responded. Kessler concluded the fact check piece by summarizing why he gave Pelosi four Pinocchios on her McConnell claim. We ob­vi­ous­ly don’t fact-check o­pin­ion. 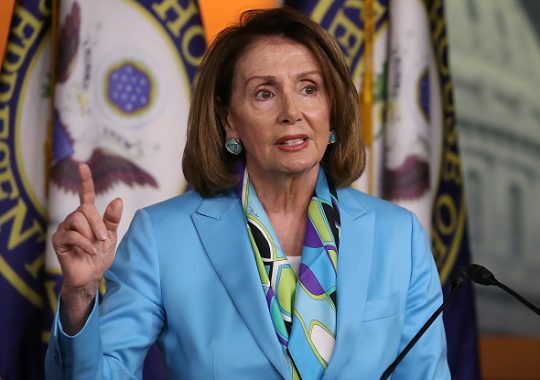 But clear­ly Pelosi’s par­a­phrase bears little re­la­tion­ship to what McConnell ac­tu­al­ly said in 2010 — he even said he did not want Obama to fail — and we are flum­moxed how this an­o­dyne po­lit­i­cal state­ment then is twist­ed into be­ing an allegedly rac­ist state­ment. McConnell was a tough cus­tom­er for Obama, his po­lit­i­cal op­pos­ite, but they did cooperate when their in­ter­ests were in sync. Democrats have some­times placed McConnell’s "one-term" com­ment in the wrong year, but we are un­aware of a seni­or Democrat bun­gling the ac­tu­al quote so much in serv­ice of an in­cen­di­ar­y charge. Pelosi earns Four Pinocchios. This entry was posted in Politics and tagged Barack Obama, Mitch McConnell, Nancy Pelosi, Obamacare, The Washington Post. Bookmark the permalink.